Apple today officially released its iOS 8 mobile operating system into the wild. It’s not much different visually or functionally than iOS 7. But there are plenty of new and useful features packed inside, including new ways to track your health, interact with friends and transition seamlessly between desktop and mobile experiences. Here's what you need to know about Apple's latest, set to come pre-installed on the iPhone 6. What devices can download iOS 8? The following devices are compatible with iOS 8: iPhone 4S, 5, 5C and 5S; iPod Touch (5th generation); iPad 2, Retina, Air, Mini and Mini with Retina. Older devices like the iPhone 4 and original iPad do not meet the systems requirements to support the operating system. And though you can technically install iOS 8 on an iPhone 4S, you may want to choose not to: Its demand on your phone will likely cause a severe slowdown in its functionality. And there's no way to revert back to iOS 7 once you've gone and installed iOS 8. You don’t need to wait until Apple sends you a push notification to let you know that iOS 8 is available – you can check for the update manually and install it yourself right now. Enter your phone’s Settings, tap General, and then tap Software Update. (Don’t forget to back up your device first!) Note that you’ll need at least 4.6 GB of free space on your iPhone to upgrade to iOS 8 over the air, and a whopping 5.7 GB to upgrade your iPad. If you’re having trouble making that much storage available, you can update your device through iTunes on your computer instead. Here are some of the noteworthy new features in iOS 8. Note that this isn't a complete list, just a set of highlights we think you'll find the most useful. You can get a full list of the new-for-iOS 8 features by visiting the Apple website. 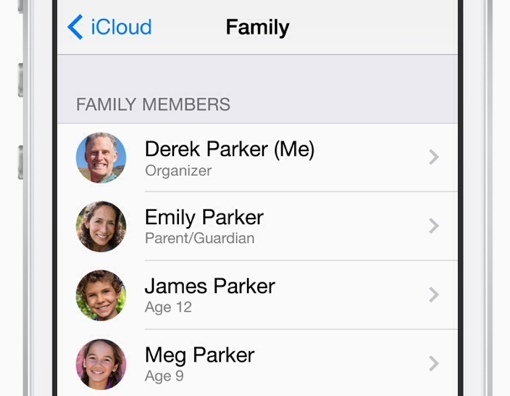 Family Sharing: iOS 8 brings a number of features that are perfect for families with multiple Apple mobile devices. You can now have up to 6 Apple IDs share iTunes, iBooks and App Store purchases, and create shared family calendars and photo albums. Kids can use the new “Ask to Buy” button to request permission to download new apps, and family purchases can all be linked to the same credit card. You can also now track your family members’ current locations via GPS to make sure everyone makes it home safe from school and work. You can set up Family Sharing in Settings under iCloud. 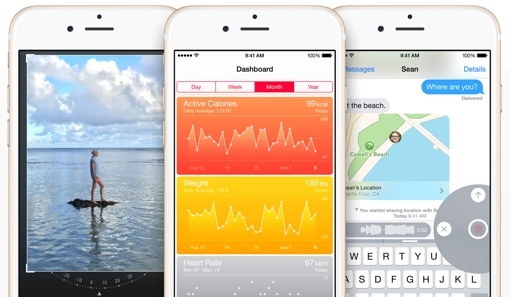 Health: One of the most awaited features in iOS 8 is Health, Apple’s new fitness data aggregator app. You can set it up to collect data from your favorite health apps and activity monitors, or you can enter data manually. There’s also a place to store a Medical ID – critical information about health conditions accessible by emergency personnel without needing to unlock your phone. 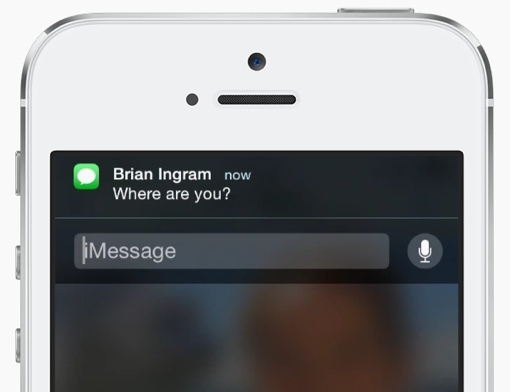 Audio Messages: You can now send audio messages via iMessage. Simply touch and hold the microphone icon in the lower right-hand corner of the screen to start recording. Then swipe up to send the audio. Camera and Photos: Your phone’s camera got some nice functional upgrades too. You can now adjust white balance, exposure, focus and shutter speed. There’s a new time-lapse mode, too. You can set photos to private so friends thumbing through pictures on your phone won’t accidentally see something you’d rather them not. There’s also a new folder for “Recently Deleted” photos, letting you to now recover shots you accidentally delete. Respond to Notifications: You can now respond to incoming texts without needing to leave whatever app you’re using at the time. When a notification is displayed across the top of your screen, simply pull it down with your finger to reveal a small reply window. It’s a nice way to save time and hassle when you’re doing something important. Continuity: Your iPhone can now interface with your MacBook or iPad, allowing you to make and receive calls and texts on any Apple device so long as they share the same Apple ID. The new Handoff feature, meanwhile, makes it easy to sync your mobile and desktop versions of Safari and Maps. You can easily share files between devices using Airdrop with the coming Mac OS X Yosemite update, due later this year. Keyboard: The touch keyboard on your mobile device now offers predictive typing, customizable to your personal writing style. Start to type a word and your phone will suggest what it thinks you’re typing (like on Android). Even if you don’t start typing, your phone will still make a handful of guesses as to what your next word will be. And if you don’t like the way the stock keyboard looks, iOS 8 now supports third-party keyboards. And much more: There are plenty more features, big and small, waiting for you to discover them in iOS 8. You’ll find a lot of these as you use your device over the next few days. But if you can’t wait, check out the new Tips app that comes preinstalled on your phone with iOS 8 – it contains a number of little-known tips and tricks to help you get the most out of your iPhone or iPad. I have not yet tried ios 8 - Really good information. But is it really worth ios 8? No more "raise to speak"